All are invited to a fun-filled family Halloween party on Thursday, October 25 from 4:30-7 p.m. at Fiesta Gardens. 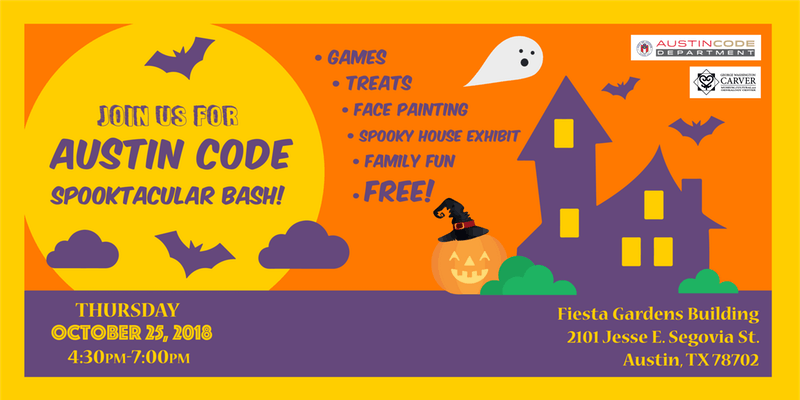 The Spooktacular Bash will be open to all ages and offers plenty of games, face painting, a bouncy house, costume contest, and even a spooky house exhibit. This community-focused family event is hosted by the Austin Code Department with participation from Austin 3-1-1, Austin Police Department, Austin Resource Recovery, and Austin Water. While the event is free, you’re encouraged to RSVP here to help the event organizers get a headcount. Did you know… the Austin Code Department makes sure city codes and ordinances are met so Austin continues to be a the wonderful, livable city that it is. These codes are in place to protect the health, safety, and quality of life for the citizens of Austin. You can learn more at the City of Austin website. We can’t wait for some Halloween fun! See you there!